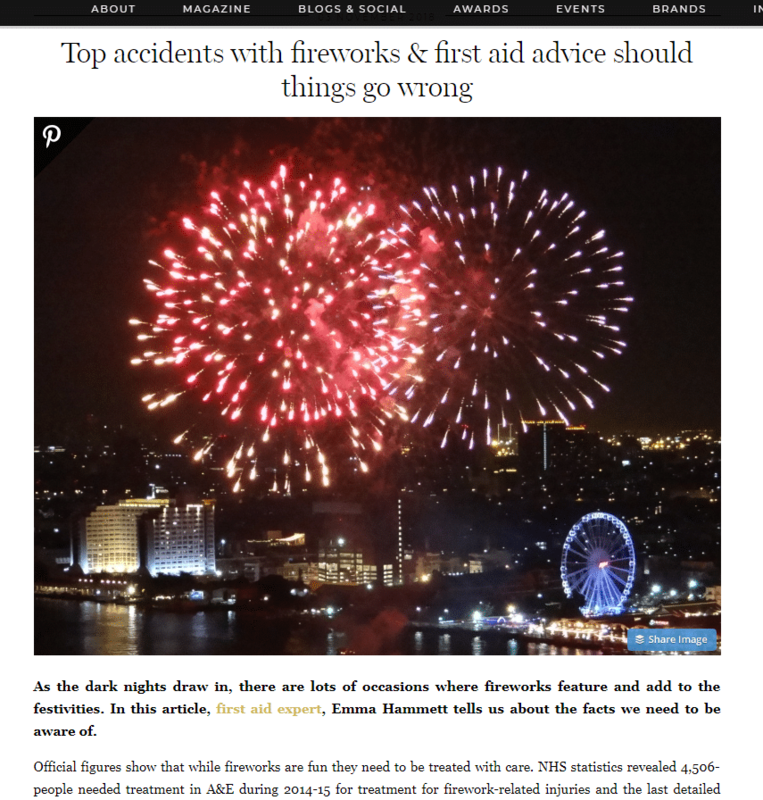 Britmums – Top accidents with fireworks and first aid advice should things go wrong. As the dark nights draw in, there are lots of occasions where fireworks feature and add to the festivities. In this article, first aid expert, Emma Hammett tells us about the facts we need to be aware of. Official figures show that while fireworks are fun they need to be treated with care. 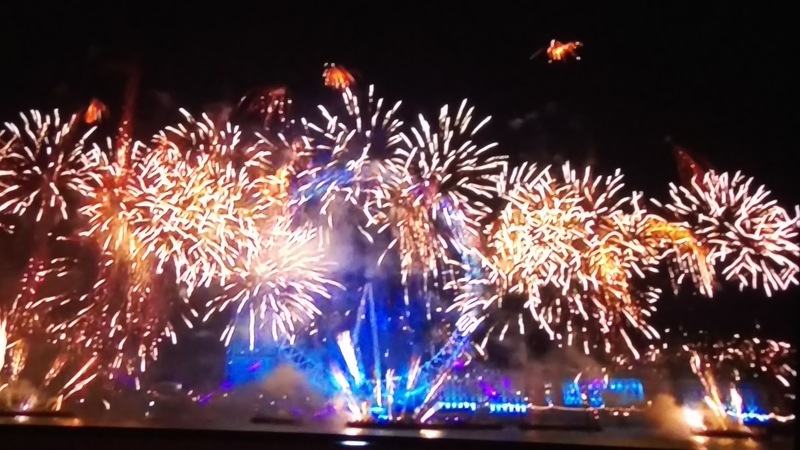 NHS statistics revealed 4,506-people needed treatment in A&E during 2014-15 for treatment for firework-related injuries and the last detailed research for Bonfire Night related injuries showed 990 injuries caused by fireworks in October and November alone. We know this is just the tip of the iceberg, as many more injuries are treated at home. The most common accidents around this time of year are burns, smoke inhalation, debris in the eye from bonfire or fireworks, and sprains and strains occurring if people trip in the dark. Follow our top tips to keep your whole (including your pets) safe, so you can have a memorable evening for all the right reasons. The safest way to enjoy fireworks is at an organised, regulated display. If you are planning to host a firework display in your home be sure to follow the Fireworks Code. Keep everyone, especially children far away from the site of ignition. Have as few people as possible involved in setting off the fireworks. 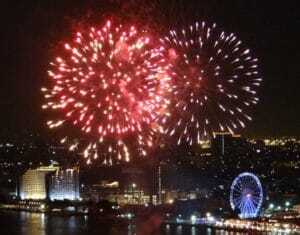 Only buy fireworks conforming to British Standard number (BS 7114). Ensure they are suitable for the size of your garden and you have space avoiding any overhanging trees. Direct fireworks well away from spectators and ideally have them inside, watching through the windows. This applies in particular to the elderly, the very young and anyone with heart issues and breathing conditions such as bronchitis and asthma. Keep all fireworks in a closed metal box. Read the instructions on the firework by torchlight not by naked flame. Light fireworks at arms length, using a taper. Never throw a used firework on the bonfire and never return to a lit firework that hasn’t gone off. It is illegal to light fireworks after 11pm. Always wash your hands thoroughly or wear sterile gloves before touching the affected area. Open the casualty’s eye and look carefully. If there is anything embedded in the eye, cover both eyes and transport them to the nearest eye hospital or phone for an ambulance. Sparklers can get up to six times as hot as a pan of cooking oil. Children under 5 years old should not be given sparklers and older children should be closely supervised. Hold the sparklers horizontally as far away from your face and body as possible and from other people. Light sparklers one by one. Always wear gloves when lighting and holding sparklers. Don’t run with sparklers and don’t wave them at others. Be particularly careful near fancy dress costumes, which are rarely fire resistant. Spent sparklers should be immediately placed in a bucket of cold water or sand. If a child is burnt and the affected area is larger than the size of their hand, you should phone for an ambulance immediately. Cool the affected area, whilst keeping the casualty as warm and dry as possible. once the burn has been cooled for at least 15 minutes, the burn can be covered with cling film or a burns dressing. Do not rush to dress the burn – cooling it is more important. Stop the person whose clothing is on fire from panicking or running – any movement or breeze will fan the flames causing them to spread. Drop the casualty to the ground and wrap them in a blanket, coat, or rug. Ensure they are made from inflammable fabrics such as wool. Treat all burns with cool running water. Remember to look out for signs of shock and keep the casualty as warm and dry as possible, whilst cooling the burn. sterile saline eye wash to irrigate eyes if sparks are blown into them. A recent survey by the RSPCA revealed almost half our dogs (45%) display signs of fear at the sound of fireworks. Similarly, cats and other animals find this time of year extremely distressing. Don’t take your pet to a firework display and please don’t leave your pet alone if you feel they will be upset by the noise of fireworks. Create a soothing den where your pets can feel safe. Fill it with blankets and cushions as noise-absorbers and put some of their favourite toys and blankets in there too. Keep your pet indoors in the evening. Keep doors and windows shut and close dog and cat flaps. Draw the curtains to minimise noises and flashes of light. Play soothing sounds or have the TV or radio on as white noise to distract your pet. A new toy, chew or blanket can prove a welcome distraction and comforter. If your pet lives outside, such rabbits or Guinea pigs, either bring the cage inside into a quiet room, a shed or garage, or partly cover the cage with blankets to muffle loud noises. If you can’t move the cage indoors, try and turn it towards the fence to minimise flashes of light. Ensure the animals can still see out. Add extra bedding to the cage so the animals have something to burrow into. Hopefully by being aware of potential hazards, we can all enjoy a safe and happy Bonfire Night and festive season. Emma Hammett runs First Aid for Life – an award-winning, fully regulated First Aid Training business. Their trainers are highly experienced medical, health and emergency services professionals who will tailor the training to your needs. Open courses are held at their London training room, or they can come and run a group course nationwide at a time and place to suit you.